Steak, that is. From basic to gourmet sauces, seared or grilled, and rare to well, we all know how we like it done. Ritualistic and precise, there is a method to our steak madness. Do you give the same attention to pairing the perfect wine with your choice cut? We realize that part of the pleasure of steak and wine is in it’s simplicity. The no-fuss approach is to reach for a solid Cabernet, Syrah, even Merlot or Malbec. There is nothing wrong with this, but we would like to share some tips to bring your heavenly duo to the next level. The rarer your temperature, the more the beef will temper your wine. If you like your steak cool and blue, you can opt for a more tannic wine. Younger Cabs, judicious oak and other wines like Syrah, should be strong enough to withhold the mellowing nature of rare to medium rare. Grills will offer the maximum amount of char, which leave a smokey and bitter taste. To offset the strong flavours from an open flame, choose a wine that is ripe and juicy. 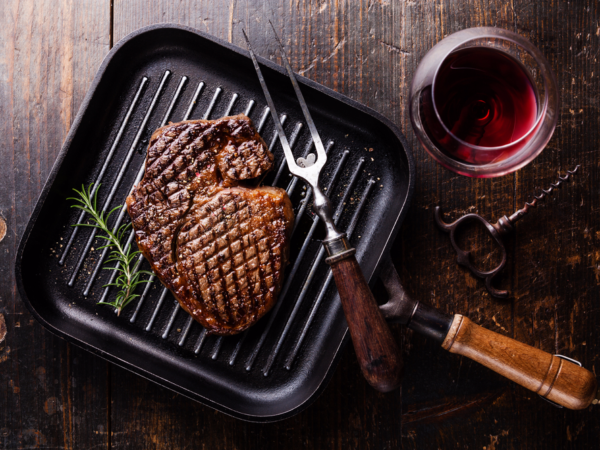 Wines like Napa Merlots, or quality Malbec will offer some sweeter tannins to balance the scorched steak. The cut of beef will have a substantial impact on the style of wine you should select. Leaner cuts like sirloin should be paired with lighter bodied wines. Depending on the local, look for Grenache and even some Pinots. For richer/fattier cuts like Ribeye, you will want a fuller bodied wine like a hearty Cabernet. Sauces will change the what wines you should be looking for. For example, a lean cut with a cream sauce might warrant a bold Chardonnay. Mushrooms have an affinity for Pinot, which would work well with flank steaks. Pepper is a bold spice that has a big affect on a wine. Liberal peppering, peppercorn sauces and crusts will increase the ‘heat’ (perceived burn from high alcohol) in a wine. High alchohol wine will seem even hotter with an abundance of pepper. Find these wines in the WineCollective e-Store. Available Now!